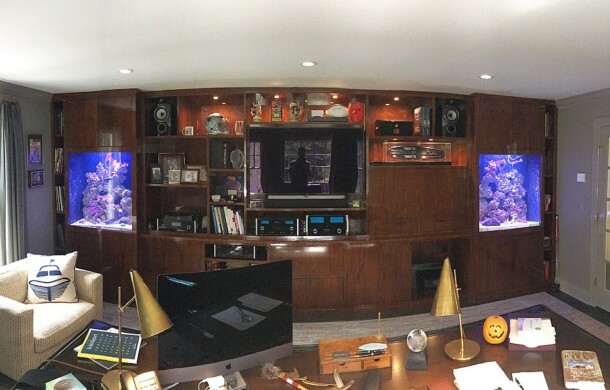 Dual custom saltwater aquarium display for home office that we installed this year. The right tank is a Seahorse environment and the left tank is a Reef Fish environment. Installation took months to design and prepare. Aquarium service is performed on a bi-weekly basis. 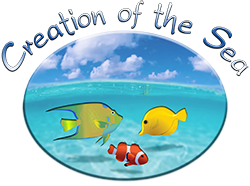 Please contact us if interested in installing and maintaining a custom saltwater aquarium (or aquariums) for your home or. 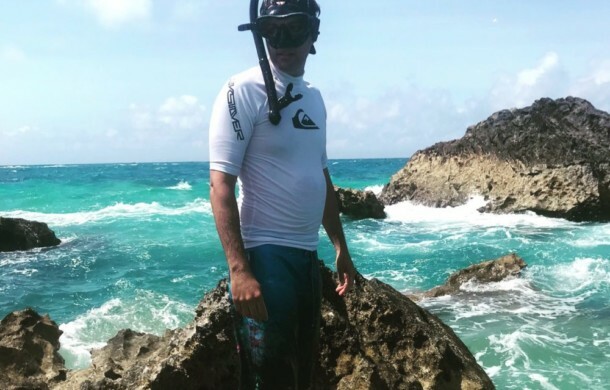 We recently snorkeled in the shallow reefs of Bermuda in search of new fish to import for our saltwater aquariums. Videos of these amazing underwater adventures can be seen on our Instagram and Facebook web sites. Enjoy!. 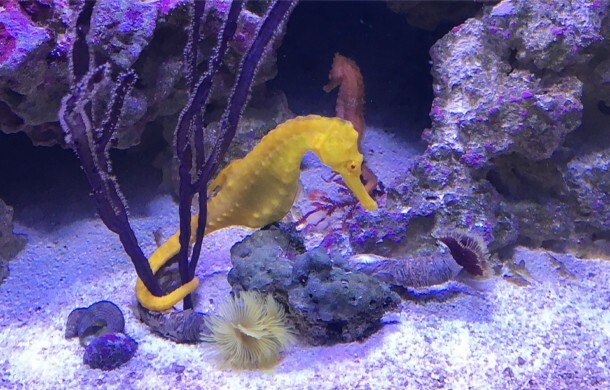 A yellow Sunfire and orange Mustang Seahorse hanging out together in one of our custom Seahorse aquariums. What beauties!!!. 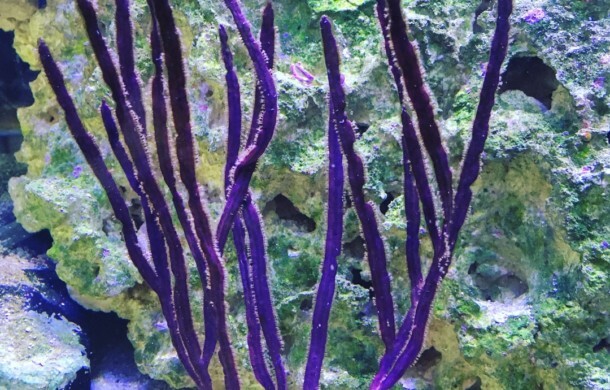 This photo shows a beautiful Purple Ribbon Gorgonian (AKA Sea Fan or Sea Whip) in one of our saltwater reef aquariums. A Gorgonian is similar to a coral, but it is classified as a different marine species. 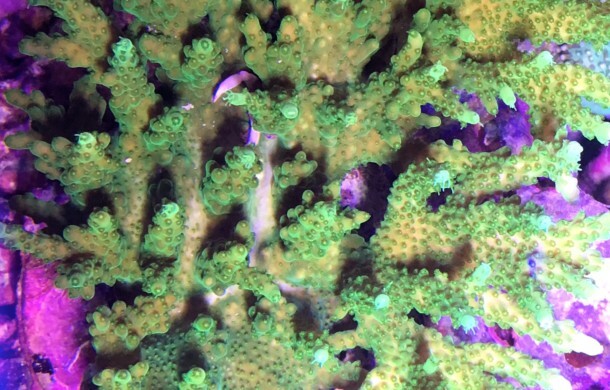 They are found all throughout the world but are particularly abundant in the shallow waters of the islands in the Caribbean Sea and Bermuda..
Corals crabs provide a symbiotic relationship with some SPS (stony) corals. 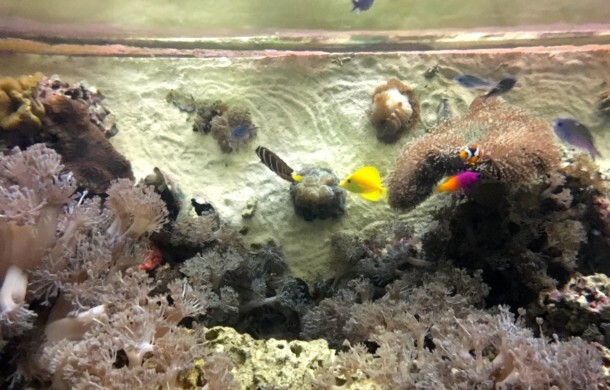 Just like the symbiotic relationship between a Clownfish and an Anemone, or a Watchman Goby and a Pistol Shrimp, or a Cleaner Shrimp and a Reef Fish, the crab and the coral both benefit greatly from having a relationship with each other. Coral crabs can be found living. Here is a top view of our 6-foot high saltwater living coral reef aquarium in Bergen County NJ. The lights are off in this picture so you can see all the way down to the aquarium bottom. Not all of the fish swim around in the aquarium when the lights are off however, but the photo still came out beautiful! . DAYS 2 & 3 of the same new saltwater aquarium installation shown in our previous post. 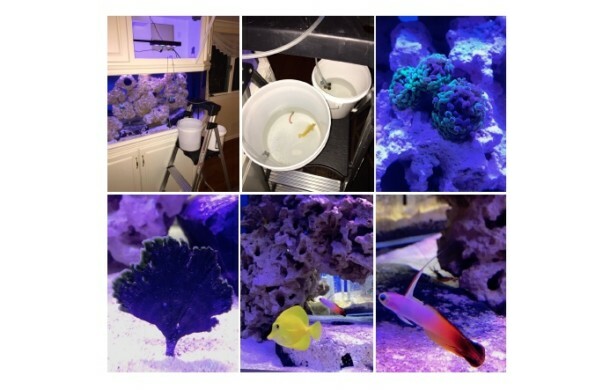 Some of the initial livestock shown in these photos were acclimated into the 230-gallon custom saltwater tank! Aquarium installation is now complete with more livestock coming soon! .